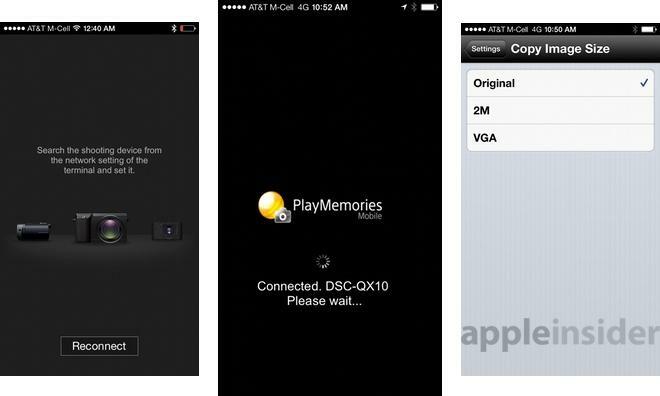 Update: Since this review was published, Sony's PlayMemories Mobile app for iOS has seen a number of updates that improve performance. We've updated this review with new paragraphs in the "Software" portion, which are marked. We have also updated the final score accordingly. The QX10 features an 18-megapixel Exmor RCMOS 1/2.3-inch sensor with a 10x optical zoom and Sony G lens, derived from the company's WX2200 point-and-shoot. It also features built-in Optical SteadyShot image stabilization. Video is captured in high-definition 1080p. 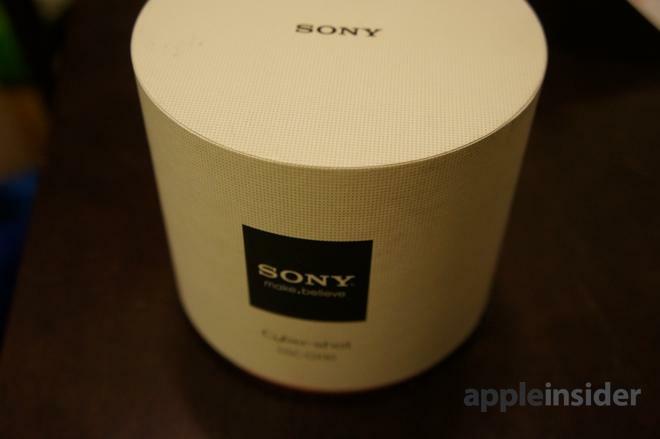 A review unit was provided to AppleInsider by Sony. Given the decent quality of modern smartphone cameras, a major selling point here is the 10x optical zoom, something a smartphone camera like the one found in Apple's iPhone simply cannot offer in a thin profile. Those looking for a significant step up in picture quality over their iPhone should consider the QX100, which is twice the price at $500, and sports a 20.2-megapixel Exmor RCMOS sensor with a wide-aperture Carl Zeiss Vario-Sonnar T lens. 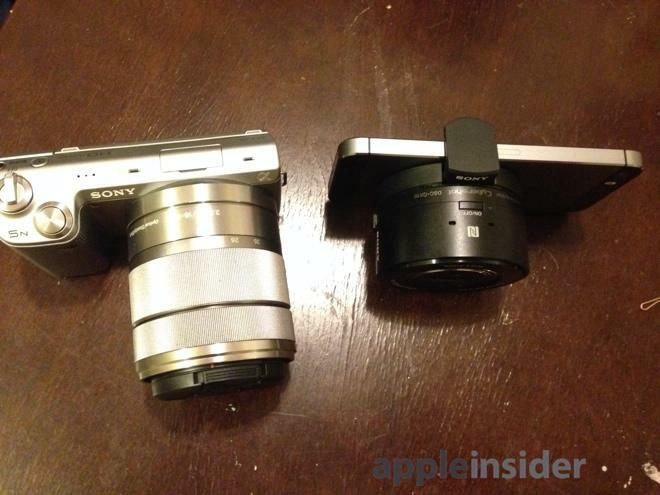 A formal review of the QX100 from AppleInsider is forthcoming. The back of the QX10 slides off to reveal a compartment that houses the battery, as well as MicroSD or Sony MemoryStick card. The back panel is attached via cord so it won't be lost, and inside are printed the unique Wi-Fi SSID and password that allows the iPhone to connect to the lens. 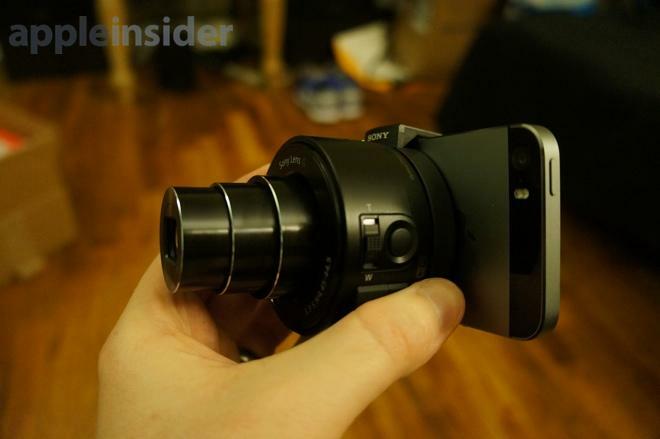 Users can then cover up the back of the QX10 with a twist-on attachment that allows the camera to clamp on to an iPhone. One of the arms on the back clamp is extendable, meaning the lens can be securely attached to an iPhone even if it's being housed in a protective case. We had no problem attaching the QX10 to our iPhone 5s encased in a Mophie Juicepack battery case. When it's attached, the lens accessory feels securely in place. We had no concerns about the accessory unexpectedly falling off, though given its wireless connectivity, you may find yourself frequently holding it separate from your phone for unique shots. The bottom of the QX10 includes a standard tripod mount, as well as space for a wrist lanyard to keep the lens from being damaged. On top are the on/off button and two embedded microphones for stereo sound. The left side of the QX10 (when attached to the iPhone and facing outward) includes dedicated controls for zoom and shutter. The shutter button is a particularly welcome inclusion, offering tactile feedback when snapping pictures, and granting the ability to autofocus before an image is taken. Like the shutter button, the physical zoom controls are also superior to the digital onscreen controls. However, it's nice that Sony gives users both options— some who are more acquainted with capturing via their iPhone may find themselves more comfortable with the touchscreen controls available. Finally, the right side of the device features a tiny inset LCD display that reveals the current battery level, and a physical sliding lock button gives users the ability to remove the twist-off phone mount adapter attached to the back. We like the design of the QX10. It's small enough to fit in a pocket, it fits snugly on an iPhone, and it's easy to zoom and take pictures with the physical controls. The QX10 connects to the iPhone through a Wi-Fi Direct connection. The unique network name and password are stored inside the device's battery component, and turning the lens on will activate the network. 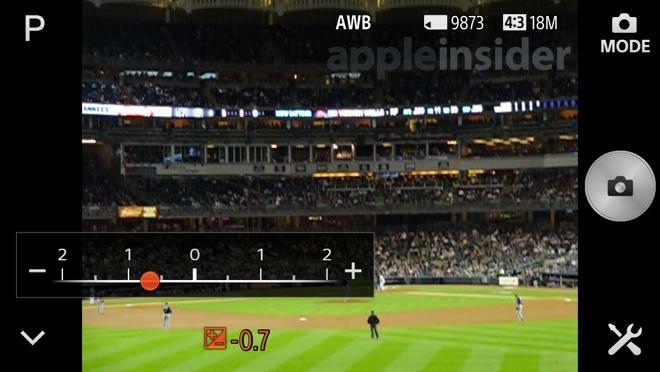 Users simply connect their iPhone to the QX10 like they would any other Wi-Fi network. Users cannot be connected to a traditional Wi-Fi data network when using the QX10, but can still access the Internet through cellular data networks. 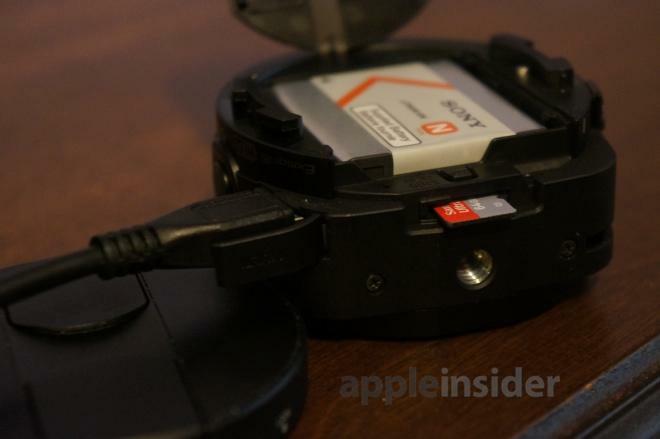 There is one potentially crucial flaw that we encountered with the QX10: Wi-Fi overload. 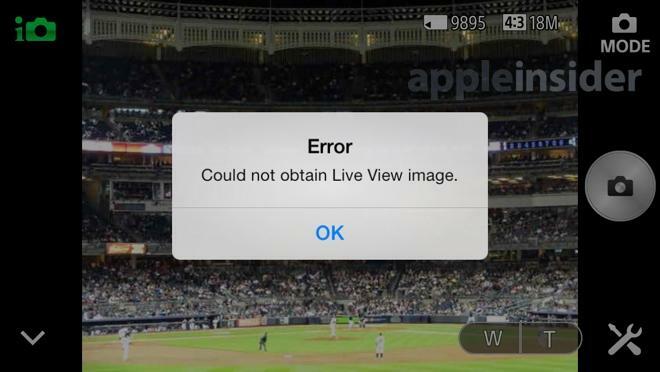 We tested the ultraportable camera at a game at Yankee Stadium in the Bronx, and lag between the lens and an iPhone 5s became so much of an issue that at points the device became unusable. Thankfully, this wasn't the norm. 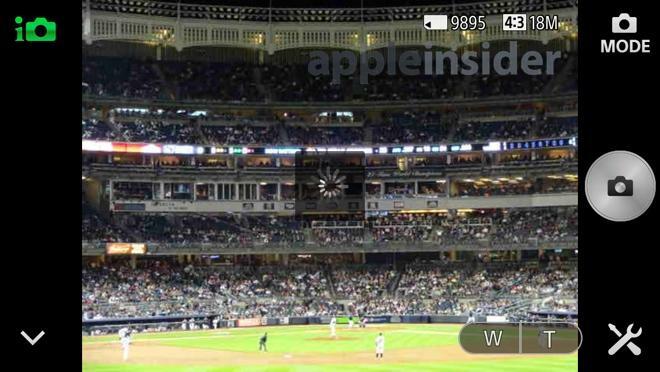 That's not to say the connection between the lens and the iPhone was always lag-free. But the stuttering and drop-outs experienced at the baseball game— where our seats were flooded with Wi-Fi networks— was especially serious. In areas with far less airwave pollution, the connection between the QX10 and our iPhone 5s was relatively reliable. The image could occasionally drop out and not reconnect, prompting us to force-close Sony's app, which is required to use the device (more on that later). It should be noted that the QX10 can be more quickly connected to an NFC-capable device, such as many Android smartphones. Apple's iPhone does not support NFC, and the QX10 does not have Bluetooth Low Energy, so support for the iBeacons feature in iOS 7 will not be forthcoming. Wireless connectivity between the iPhone and the QX10 is an important component of the versatility of the device. While you can clip the camera lens to the back of your iPhone, and will likely use this setup most of the time, it's when the iPhone is separated and acting as a remote viewfinder that the versatility of the QX10 truly comes alive. You can get a few feet away from the lens before the connection to begin to stutter or completely drop out. But really, great distances between the iPhone and QX10 are not necessary to get some pretty interesting shots. For example, families getting together for a group picture will no longer need someone to snap the picture for them. 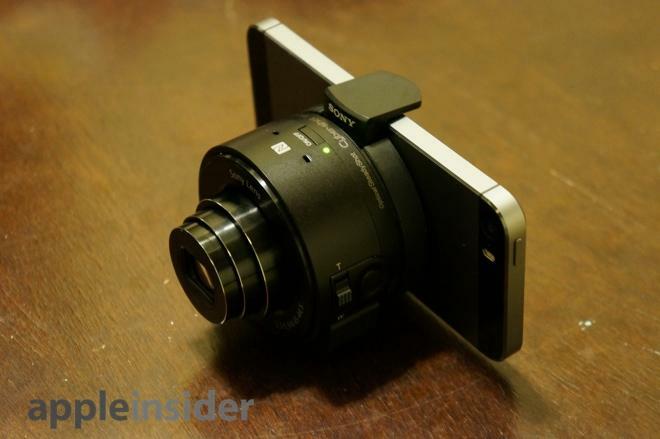 The QX10 has its own built-in tripod mount, and can be remotely viewed and controlled from the iPhone. Someone could set up the camera, ensure everyone is in the picture, and snap the picture, all while standing in front of the lens. And really, this is just the start. With the tiny size of the QX10 lens, and the decent picture quality with a 10x optical zoom, this is a lens that will allow photographers to take shots that wouldn't otherwise have been possible. The wireless connectivity of the QX10 is simultaneously its greatest asset and most crucial flaw. This is where the shine really starts to come off the QX10. Sony's pocketable wireless lenses are currently reliant on a free application called PlayMemories Mobile, which frankly doesn't offer much in the way of customization. There are digital controls for zoom and shutter, which can be used in place of the physical controls on the lens. And there is no true "manual" shooting mode, as the only three options are "Intelligent Auto," "Superior Auto," and "Program Auto." 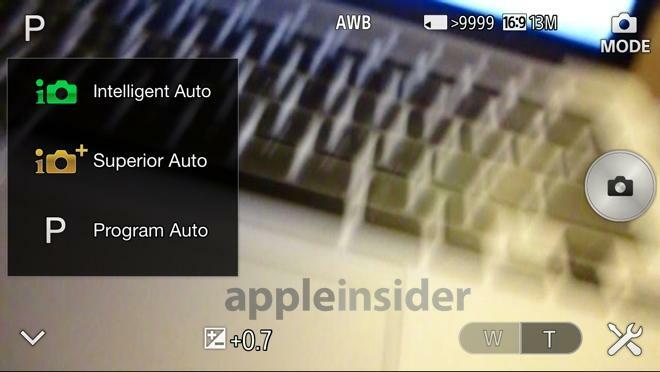 Intelligent Auto is a completely automated setting where users simply focus, snap and shoot. The Superior Auto setting snaps a number of pictures and creates a composite. With the Program Auto option, users are given access to exposure compensation, allowing them to control the exposure of the lens and affect the picture's brightness. A separate settings button allows access to basic features like self-timer, changing image file size, and whether to automatically transfer snapped pictures to the iPhone's Camera Roll. Captured at max resolution, pictures are 18.2 megapixels. There's also an option for 16:9 ratio pictures at 13 megapixels. 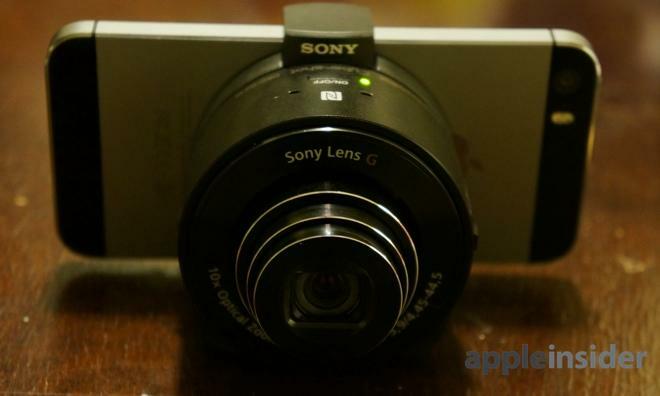 Sony's software also gives the option to share pictures to the iPhone at 2 megapixels, to cut down on file size. From here, users can also select "Copy from Connected Device" to view the full selection of photos and videos stored on the QX10's MicroSD card. Content can be selected in bulk and transferred to the iPhone where it can be edited, uploaded, or anything else. By leveraging the iPhone's touchscreen, Sony's software offers a feature that iPhone camera users are likely accustomed to: Tap to focus. 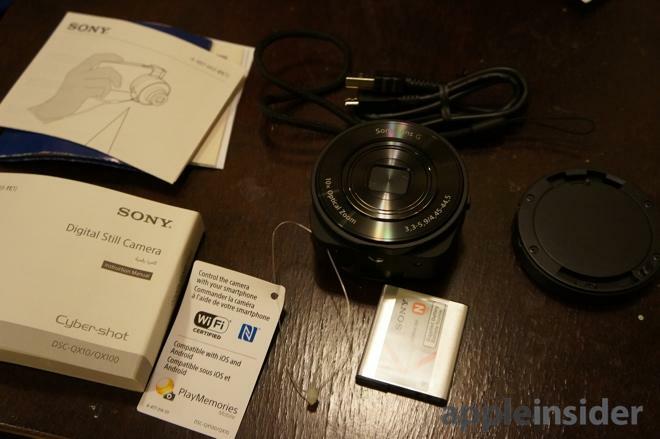 Sony already offers this capability on its NEX line of point-and-shoot cameras equipped with touchscreens. The PlayMemories app can take upwards of 10 seconds to connect to the camera and enable shooting after it's been launched. That kind of delay may be a deal-breaker for some. Convenience is key for a camera, and the QX10 fails in that respect on the software front. It should be noted that the dedicated shutter and zoom buttons on the lens itself, along with its own MicroSD memory card, allow the device to be used to shoot photos on its own, even without a smartphone nearby. 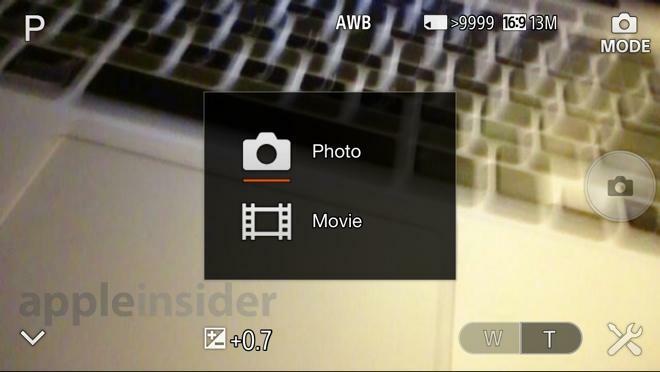 But without the PlayMemories app, users are shooting blind, with no viewfinder available. Getting the camera set up to use an iPhone as a viewfinder requires connecting to it over Wi-Fi, launching the app, and waiting for the connection to be established. Frankly, it's too long, which makes occasional crashes with the PlayMemories app even more unacceptable. Making matters worse, we encountered a number of times where the application would simply freeze, seemingly after losing connection to the QX10. Force closing the application and restarting would usually resolve the issue and reestablish connectivity. Thankfully, there is a chance that the functionality of the QX10 could be expanded through third-party apps, as the camera is not tied to Sony's PlayMemories software. Well-reviewed iPhone app Camera360 has told AppleInsider that it will support the QX10 with an update coming in early October. Update: Sony delivered a number of updates to the PlayMemories Mobile application in October that have improved performance, though the software is still far from perfect. The updates add compatibility with iOS 7, which Sony said was not present in the previous version we tested for this review when it was initially published. While previously it would take 10 or more seconds for the PlayMemories application to establish a connection with a QX camera and begin shooting, now that connection time is closer to 5 seconds. 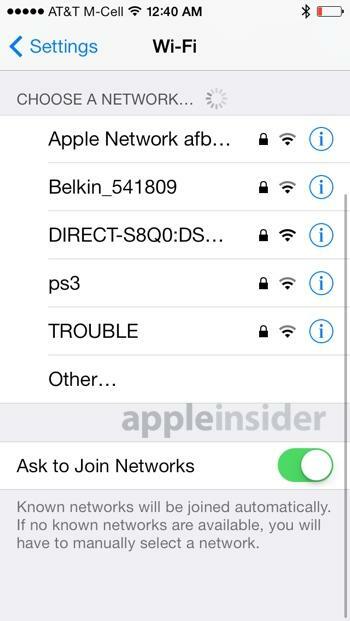 While this is a big improvement, we don't feel it's enough, though Sony may be hampered by the limitations of Wi-Fi Direct.